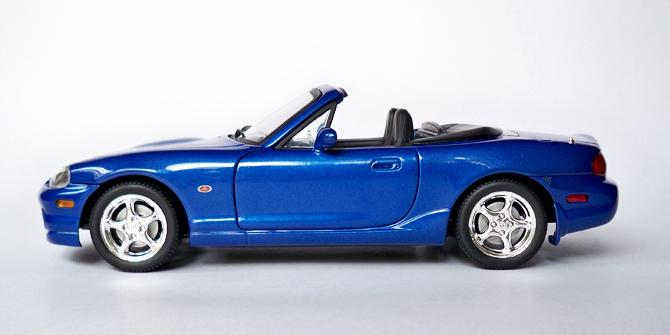 The Mazda MX-5(also called as Miata) is a two-seater roadster built by Mazda in Hiroshima, Japan. The model was introduced in 1989 and is now in its third generation. 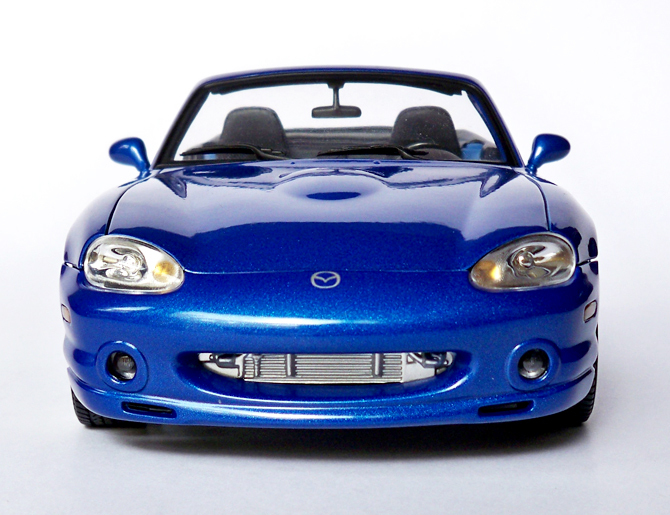 Mazda sold over 400,000 units of its first generation Miata from 1989 to 1997. It is built around a light weight body which is a unibody or monocoque construction with a traditional front-engine, rear-wheel drive layout. The latest generation cars introduced in 2005 have 2liter engines which produce above 170bhp. 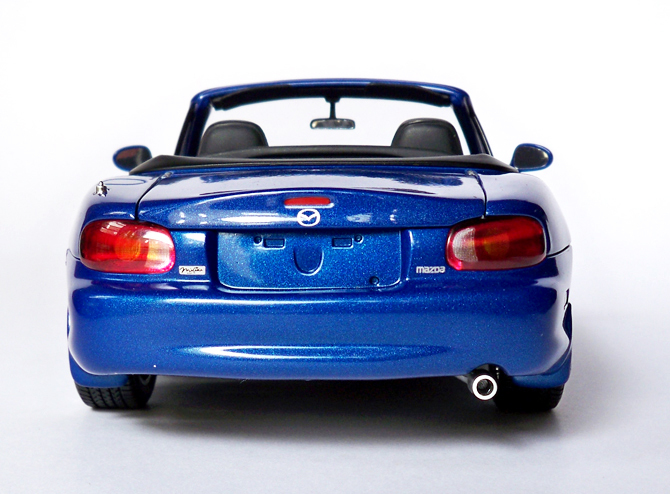 Mazda’s line up of Miata includes a coupé convertible version with a three-piece folding hardtop, Power Retractable Hard Top. 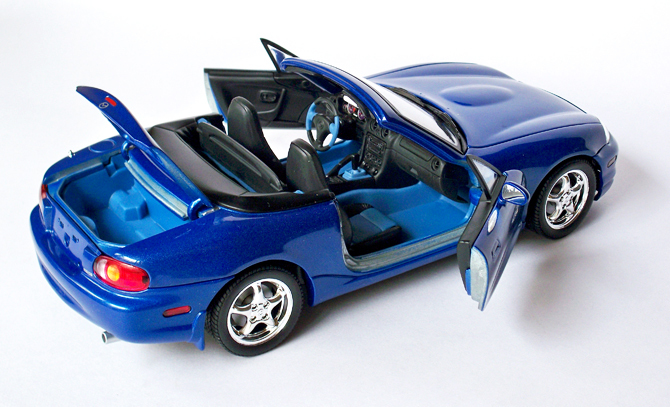 What I have here is a 2nd generation Miata made by a China based diecast car maker “Gate”. This model in “Laser Blue Mica” as it is called looks awesome and if kept near a AA model, starts a fight for attention as its paint job is next to fantastic. The chrome finish on the alloy wheels and aluminum front grill (or exposed radiator) are a class act. 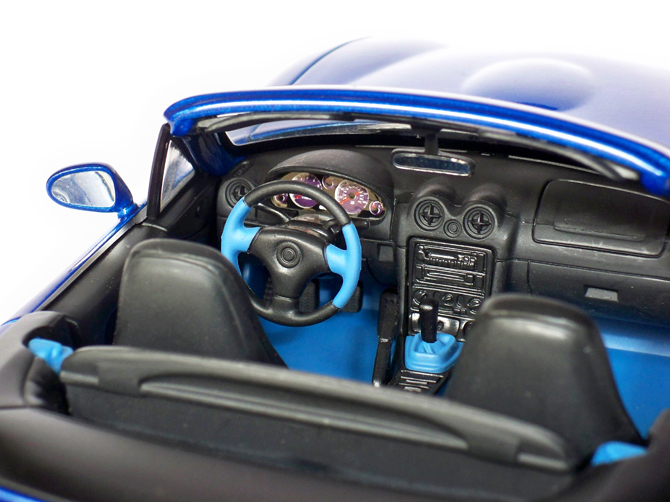 It has a working steering system, opening doors, trunk and hood. 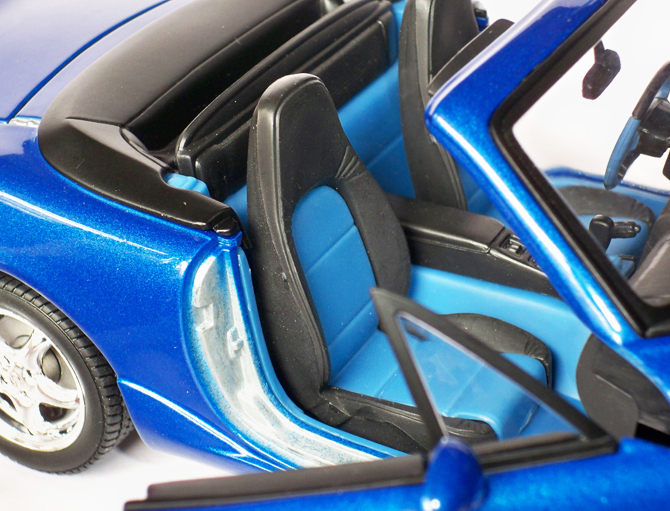 The interior though made out of plastic looks very realistic with the dual tone seats and body colored carpeting scheme. The dials and instrument cluster are very nice so as the gear lever and (sealed) glove box. The engine is detailed but kind of plasticky, but for a budget model it gets above par score in this department. The underbody is also exceptionally crafted which I personally liked a lot I guess you agree with me too. With a lot of fair points, it losses its pose on closer inspection as the doors rattle and they don’t shut! 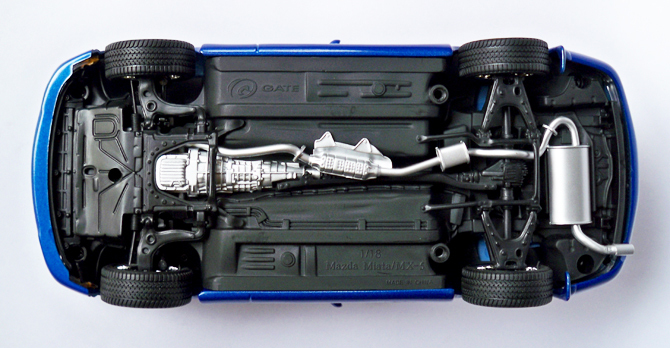 Underbody painting is very poor, in some points you can almost see the aluminum diecast layer itself. I was just wondering how could this happen if they can do a exceptional paint finish outside (just like a real car) and almost forgot the underbody. Now for the verdict, this is a very good model if you are going to keep it in the display and admire its beauty but if you want to take it out and show it off to friends and other fellow collectors this is not for you. At Rs.900 it is the cheapest 1:18 model I set my hands on and never regret for buying this beauty. Yes they are, I see a few here in India, small yet slick for Indian traffic condition. I totally agree with you. I’ve been looking for this model for a long tima but I can’t find anything. I would appreciate it if you tell me where I can buy one for my collection too. Please let me know. I really like it. It had became one of the tough model so ebay is the best bet!! I got one of the last few that ModelArt Bangalore Had!! All the best. 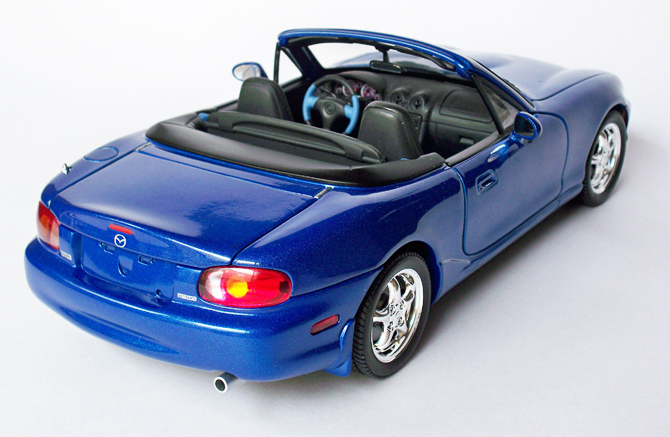 I am looking for a model mx5 nb model. Ho can help me to get this Gate model. Buddy I would love to help but this being a discontinued model is kind of tough to find!!! Any ways will update you if I come across any!! 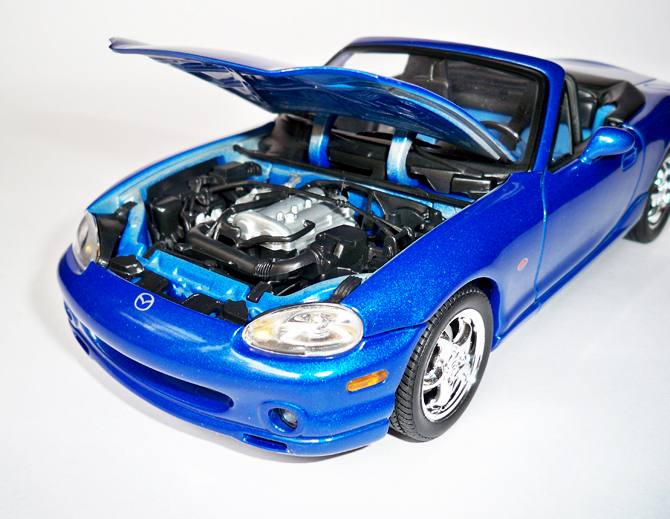 BTW AUTOart has some Mazdas too….check them out! Just thought I’d add my two cents. 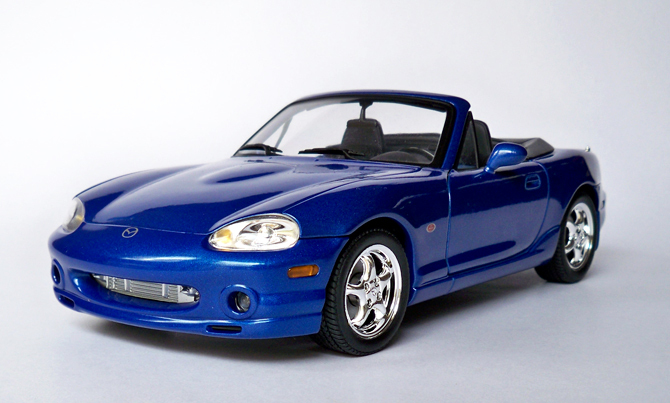 While I can’t quite make out the details of the badge on the left front fender between the wheel well and the door, it looks like this is a replica of a specific Miata model. I suspect the badge designates it as a 1999 10th Anniversary Edition limited production model that was painted “P20 Sapphire Blue Mica” and had a lot of other one-off attributes. 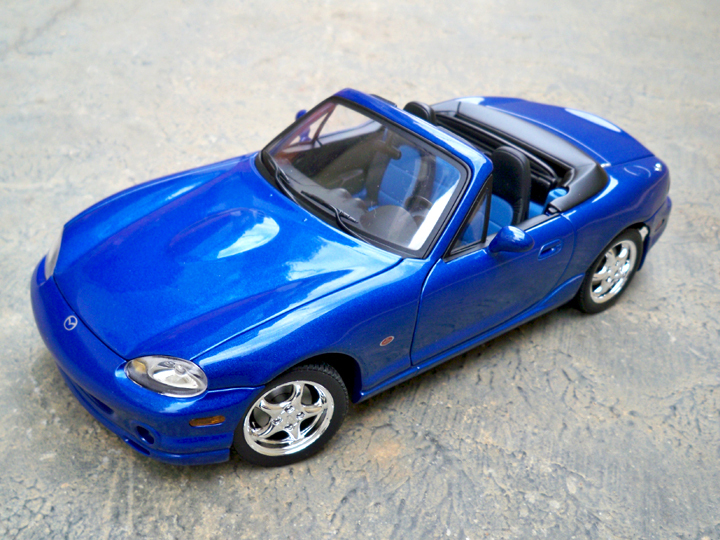 I’m knowledgeable on this because I own one of the actual cars and a NIB Gate 10AE Miata die cast model myself. If it is in fact supposed to represent a 10AE, there are actually a few details missing. Thanks, and have a good day! Hey Gerg, This is indeed a replica of the real model (i.e. 18 times smaller scale model) and thanks for the info.